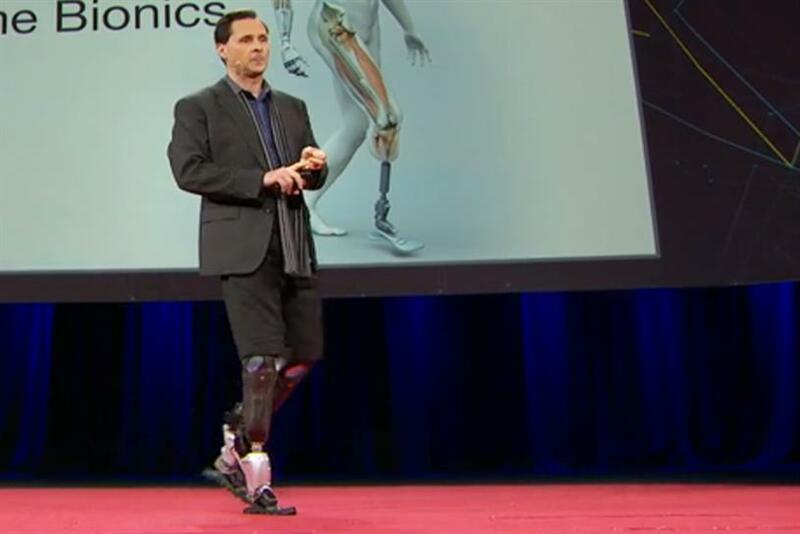 Hugh Herr, head of Biomechatronics at MIT Media Lab, at a March 2014 TED Talk. AUSTIN — The challenge of being in the futurist biz is that you can get quite jaded about events like SXSW Interactive. Since you’re in this stuff all time, you’re usually pretty up to speed on where retail is headed, or (snore!) wearables. It also makes you more judgmental of the panels. Finding the truly new and disruptive ideas — or attending the right talk with visionaries — is like searching for a needle in a haystack, especially with SXSW’s bloated schedule. When you pick a mediocre one, you break into a panic that Room C down the hall is having a whale of a time hearing how monkeys will, in fact, power the Internet by 2020. But then, when you find something great, it’s magic. A key tactic I've adopted is to go to things outside my main day-to-day focus or seemingly a bit off the wall. A friend of mine (Michelle Sadlier, head of innovation and social media at Hunter Boots) says one of the most useful talks she went to was on sports marketing and how the sports industry has created year-long fan communities beyond events. That is something fashion could learn from. Another tactic is simply to shun panels entirely and focus on events — after all, SXSW interactive is as much about people you meet as stuff you learn. Year upon year, some of the most brilliant people I've met, and thought-provoking discussions I've witnessed, have been off schedule at special networking lunches, salons and cocktails. Then there was the Twitter Women's brunch that drew female founders, VCs, directors and strategists from the Levo League to Andreessen Horowitz and a host of new companies. I co-hosted a sundowner gathering with FashMash, a retail and tech network founded by WGSN's Rachel Arthur. The event at The Four Seasons was attended by a group of fantastic women, including Liza Kindred, founder of fashion tech think tank 3rd Wave Fashion; Kate Unsworth, founder of Kovert Designs, a wearable-tech jewelry label; and Kate Walmsley, the director of digital at Topshop. I also joined a panel at Soho House's pop up with Protein (a consumer insight consultancy) and Dazed and Confused magazine. We talked about women in technology — as a market, but also a force in innovation and entrepreneurship in tech. I was joined on my panel by the incredible Elizabeth Gore, entrepreneur in residence at Dell; Emma Sutton, head of marketing for Dazed and Confused; and Tamsin Glasson, founder of gaming/media company Verse.works. We talked about women as tech consumers (women now control over 50% of tablets and make up over half of gamers) but also leaders in technology. Soho House commandeered a modern farmhouse/hangout in the backwaters of east Austin for the crossover days between Interactive and Music. It had all the transplanted Soho House stylings: a spot in the middle of nowhere (taxi drivers were bemused); staffed by hipsters; and decked in the leather sofas, industrial steel chairs and sheep skin throws. What else at SXSW? Artificial Intelligence discussions were interesting. Martine Rothblatt, CEO of United Therapeutics Corp., talked about how artificial intelligence will allow humans to become immortal by replicating them. Hugh Herr, head of Biomechatronics at MIT Media Lab also hosted a keynote dubbed "Extreme Bionics: The End of Disability." Herr talked about how we are moving beyond prosthetics that bring humans back you back to zero, that are compensatory — electromechanical enhancements that will "eliminate the barriers between human limitation and human potential." This is such a fascinating transition right now. We covered it in The Future 100 report I released in December. Increasingly — from clever fabrics that accelerate your workout, to exoskeletons, to prosthetics — we're moving beyond the idea of using technology to solve disabilities and be compensatory. The next era will include "augmented humans" who are capable of much more. This of course will create ethical concerns, but it's exciting to see. It also forces the question: Is normal actually better? I wonder what this could mean in athletics. Will we see new no-rules athletic platforms that see how much the technologically boosted human can do? Finally, one interesting twist — or at least a sign of the increasing influence of user-generated content — was Diesel's new campaign. It was unveiled by Nicola Formichetti at an event hosted by Dazed and Confused on Monday night at Justine’s (a stone’s throw from Soho House). Rather than using a big-name photographer, Formicetti picked out Instagrammer Doug Abraham, a k a "BessNYC4." I wonder if this the sign of things to come. The explosion of user-generated platforms from Twitch, to beauty vloggers, to Vice’s citizen journalism, proves there’s a desire for consumers to create and consume peer-generated content. Platforms like Instagram and amazing new apps for smartphones are allowing users to take professional standard photos and also be creative with treatments. Brands from Marc by Marc Jacobs to Dove have featured consumers. Will future campaigns be created by them? Lucie Greene is worldwide director of JWT Intelligence.